The book fails to note that the NOAA charts are accurate. Least depth is 20 feet at zero tide. The navigable channel is at least several hundred yards wide. Not very difficult, in other words. And breathtaking! 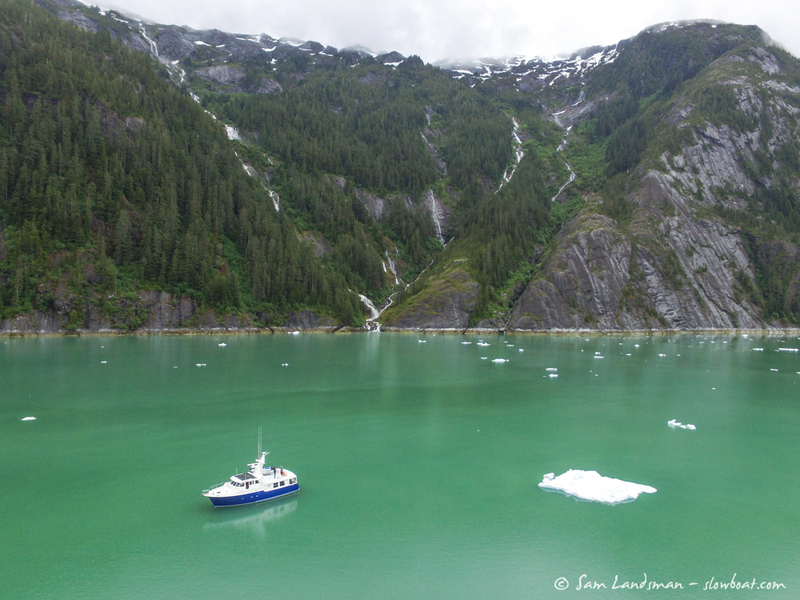 Thanks to the above description, few cruising boats wander up Le Conte. Their loss. The ice is as beautiful as anywhere else, sheer granite walls tower above, waterfalls pour down from snowfields and hanging glaciers. Trying to compare places like Le Conte Bay and Tracy Arm and Endicott Arm and Glacier Bay is crazy. They’re all magnificent. Overwhelmingly beautiful. Not better or worse, not more or less beautiful, just different. Rather than take all the boats up Le Conte Bay, we opted to ride on two: Nordhavn 50 Akeeva, and Nordic Tug 42 Orca Star. We left about 8:30 a.m. and made breakfast underway…breakfast sandwich makers are a hit this trip! The weather cooperated nicely. A few showers, a few sun breaks, no torrential rain. The ice didn’t totally cooperate, and we didn’t make it in far enough to see the face of the glacier. Conditions were calm, though, so we launched kayaks and dinghies and played among the icebergs and seals for a few hours. 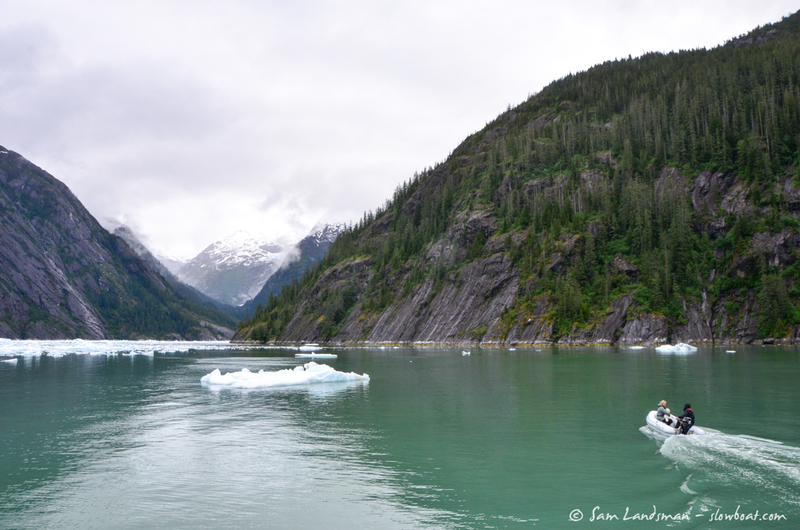 Even without seeing the glacier, the scenery is incredible, and there’s no better way to experience it than from a kayak, dinghy, or other small boat. 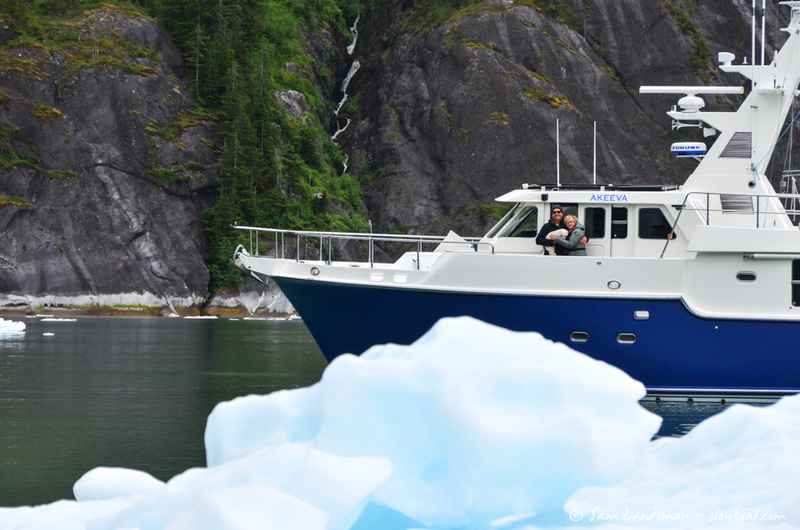 In the context of these glaciers, even the 80,000 pound Nordhavn seems utterly insignificant. So many seals and seal pups in here! Kevin took the drone up in the air for some aerial shots and got some great ones! Of course, we collected a few bergy bits for happy hour. Back on Safe Harbour we set out a small chunk and made ourselves a little ice bar! Because glacier ice has been compressed for thousands of years, it makes a nice clear ice similar to what high-end restaurants/bars pay a premium for in order to make the super-clear big cubes. After cocktails (and too much delicious pizza, ordered to-go from Papa Bear’s Pizza for dinner), a few of us walked up to Kito’s Kave for a beer and some local color.